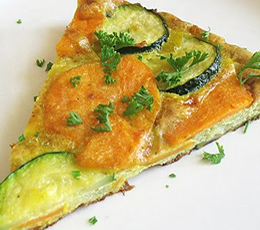 “Easy oven-baked frittata loaded with creamy soft sautéed sweet potato, leeks and crunchy zucchini,” thanks to our Featured Foodie, Lisa’s Kitchen! Transfer the skillet to the preheated oven and bake for 15 to 18 minutes or until the eggs are set in the center, which you can test with a cake tester. As soon as the frittata is set, turn on the broiler and move the oven rack up to the top level. Broil for 2 to 3 minutes or until the top is browning nicely.